Sometimes strange things happen at Croc Valley Camp. You might get startled by weird grumbling noises in the middle of the night, your freshly peeled banana just mysteriously disappeared out of your hand – who broke the fence last night and what is your towel doing up in the tree? No reason to worry. It is very likely that your fellow travelers didn’t suddenly turn crazy or suffer from a mysterious bush fever. It’s all part of the adventure that you signed up for. An adventure that doesn’t start with watching wild animals on a Game Drive, an adventure that starts within the Camp - with a troop of baboons waking you up in the morning, a herd of elephants quietly passing your tent or a business of mongooses suddenly appearing out of nowhere (And yes, a group of mongooses is really called a "business"). Croc Valley doesn’t have fences to separate the wilderness from the Camp, so you might encounter wild animals, big and small, dangerous or harmless, on a regular basis. It might not be normal for you to have baboons and hippos grazing in your garden or elephants drinking from your swimming pool, so we thought it would be a good idea to introduce you to our wild visitors, their habits and behavior, so you are best prepared for your great adventure in the African Bush. 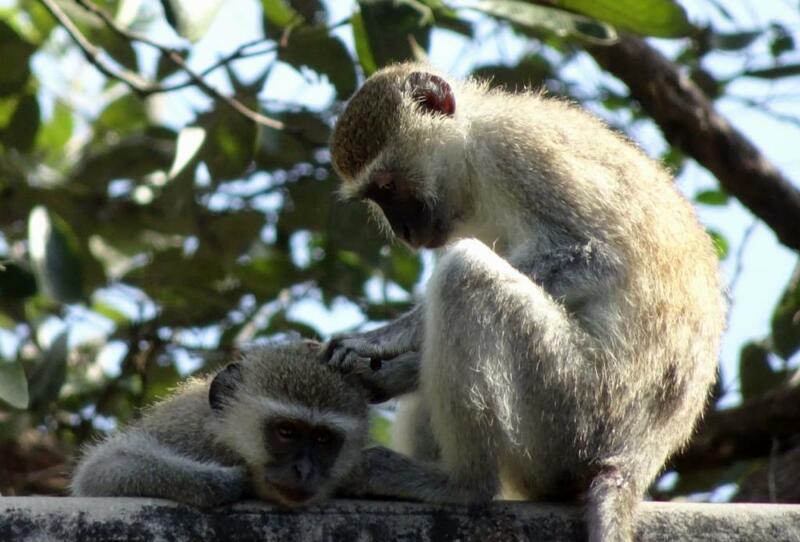 You will be very likely to encounter our resident Vervet Monkey troop, a group of about 20 grey-yellowish small monkeys who are both very cute and mischievous. 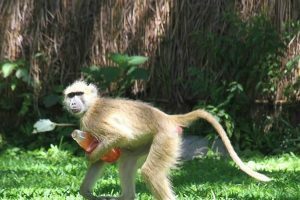 You will find them scattered around Camp, grooming, playing, feeding on leaves, seeds, fruits and flowers, while moving from one end of the Camp to the other for several times throughout the day. 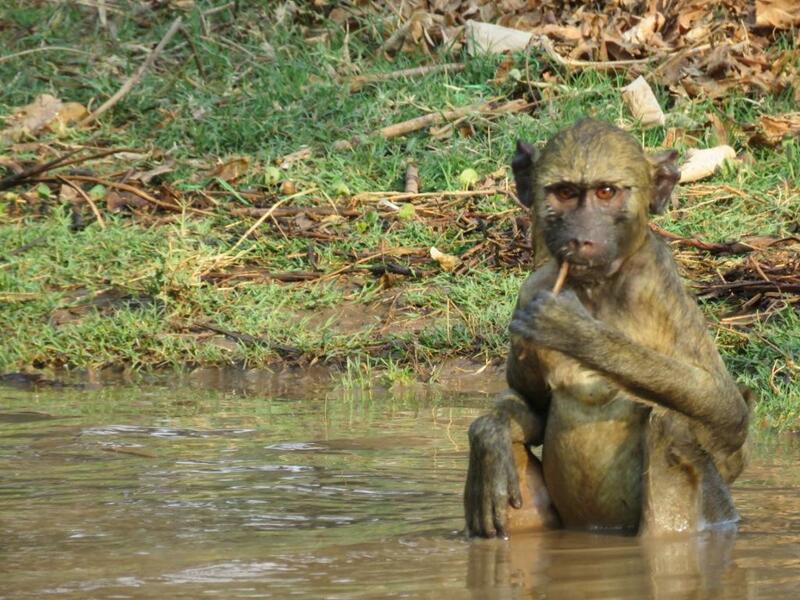 These monkeys form a very social family bond, but also appear very aggressive when it comes to dominance hierarchy, especially in-between the mature males (easy to recognize as they have distinct blue balls). Facial expressions (such as raising the eye lid) and body postures are used to communicate threats or aggressive behavior. 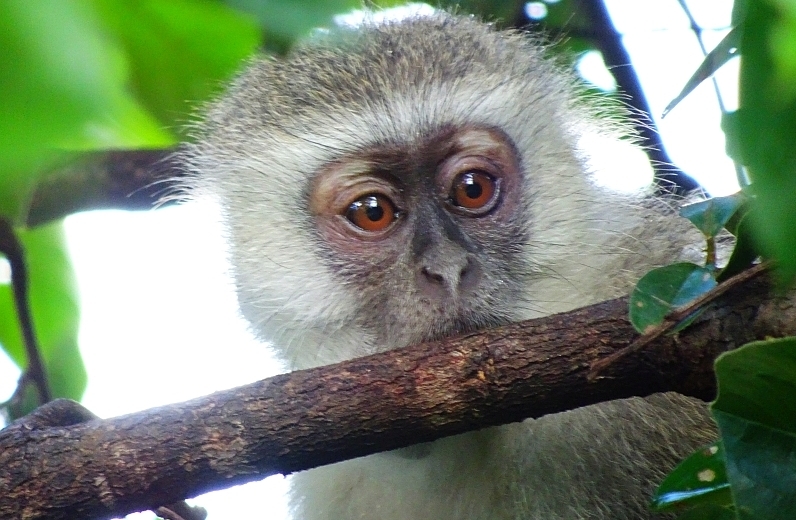 Vervet monkeys normally show more tolerance towards men, but tend to become more provocative towards women and children. So better don’t look too deep into their eyes, as they will challenge you for dominance (usually through raising their eyelids). With their human-like behavior, these playful animals will always bring a smile to your face. 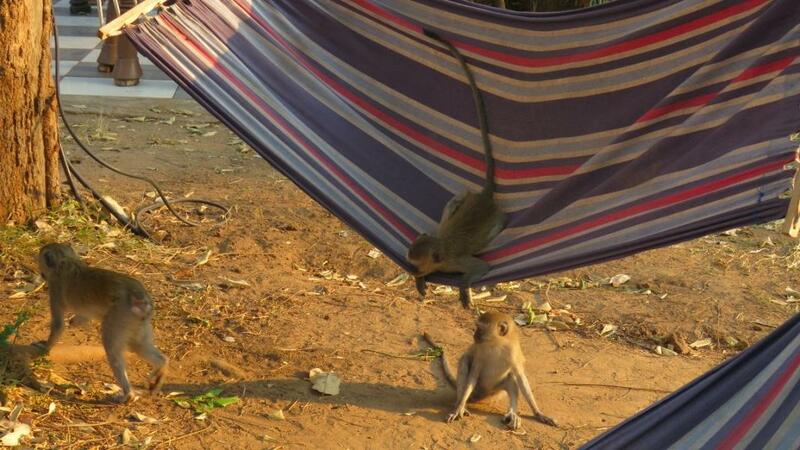 They love our hammocks and tent canvases, especially the youngsters are very fun to watch. But always be on the watch-out! 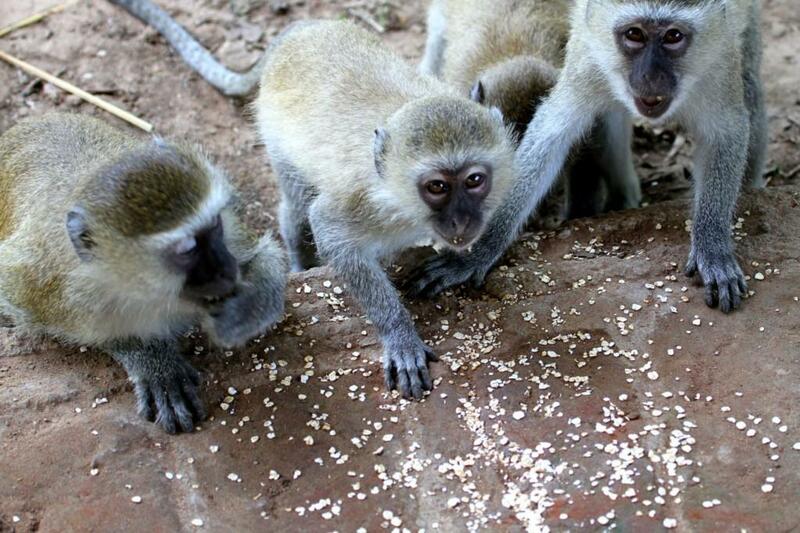 These monkeys love your food just as much as you do, and they are very clever in getting what they want! It only needs a second of inattention and you’ll find your beloved Burger running up a tree. 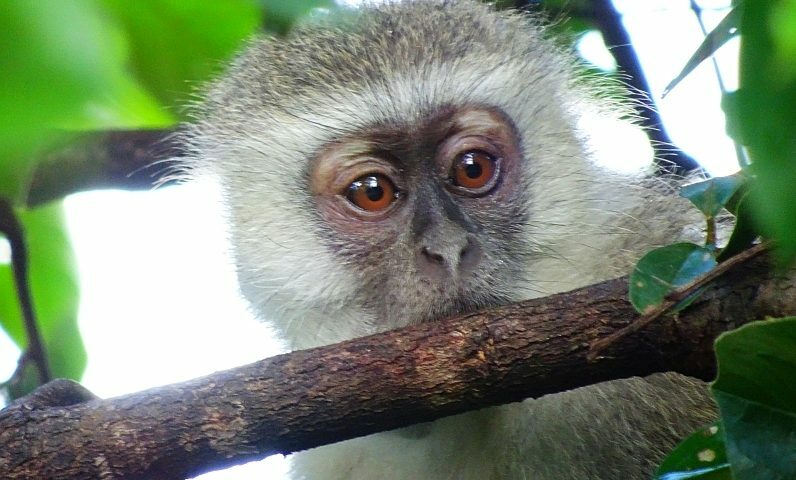 It is believed that Vervet Monkeys have up to 30 different alarm calls; each one specialized on a different predator or threat. For example, leopard alarm calls will make the monkeys respond by climbing into trees. Eagle alarms are low-pitched grunts to which Vervet Monkeys respond by looking up into the sky trying to locate the potential predator. Snake Alarms are high-pitched chatters, to which the monkeys respond by searching the ground. Every now and then you might get startled by hysterical screams coming out of the Bush. Sounding like a scene of a pretty serious mass-murder attack, you might prepare to rush to help the victims, but instead find a group of pretty furious baboons chasing each other through the thicket. 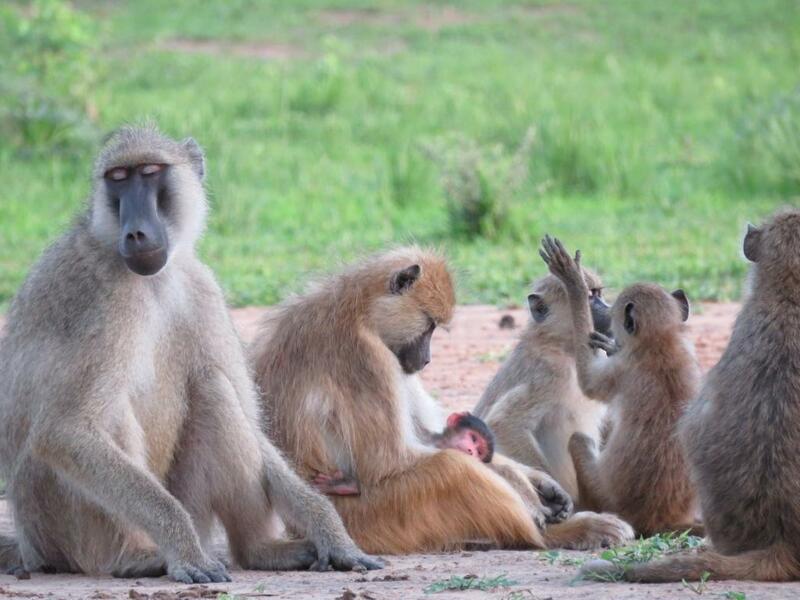 It is generally very hard to ignore a group of baboons, especially when the very vocal 200 individual-strong troop is roaming the Camp in the early mornings and late afternoons. You will find males, females and infants travelling together in search for food such as fruits, plant parts or insects. 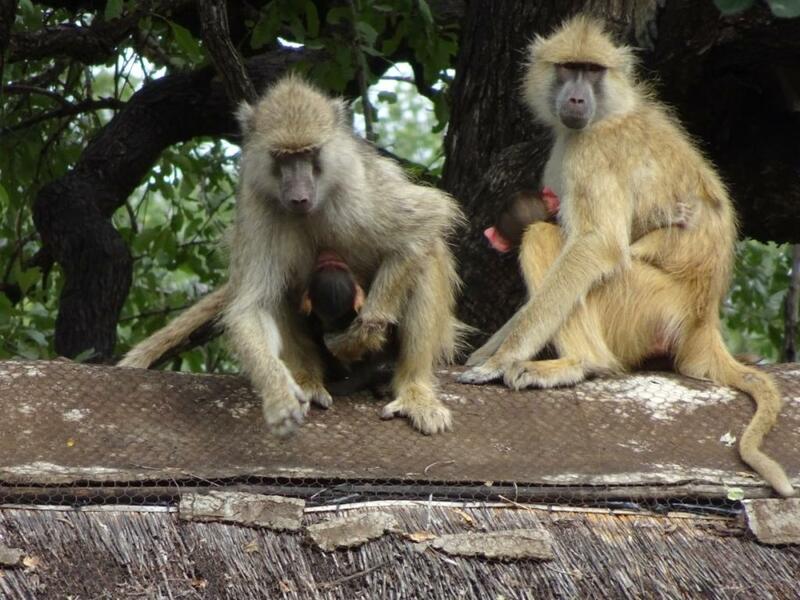 Baboons, especially youngsters, love to play around water paddles, tent canvasses, roofs, verandas and cars – often in a destructive manner and giving a hard time to our maintenance manager. 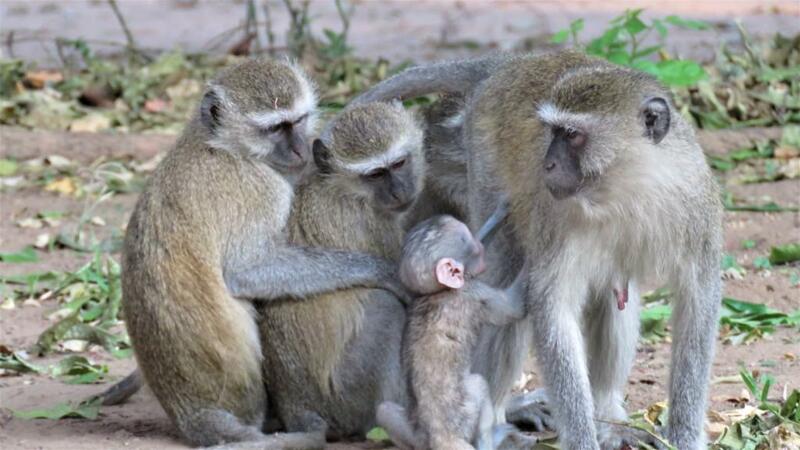 And as you might notice, group hierarchy is a very serious matter for baboons. Male yellow baboons exhibit a dominance hierarchy in which the largest, most capable fighters are the most dominant. Females remain in their natal groups with their close female relatives and inherit the rank of their mothers. 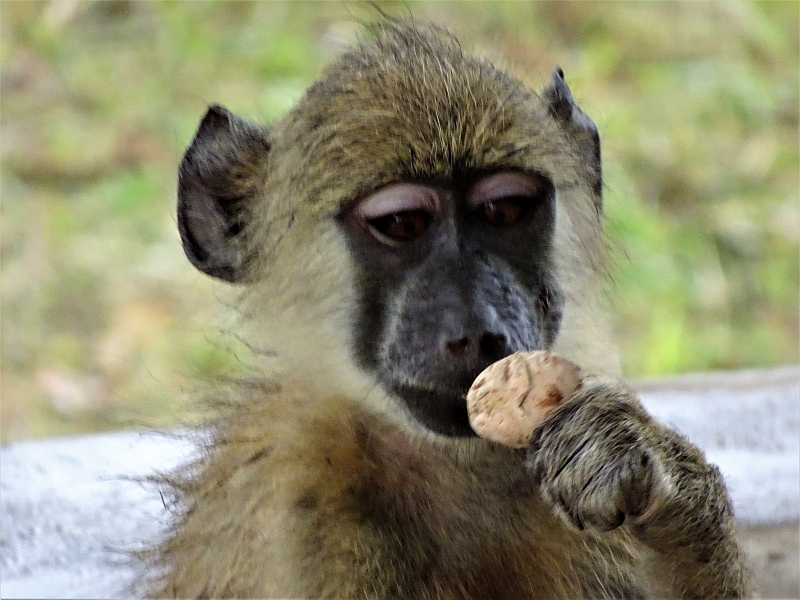 Submissive baboons usually respond by averting their head and body, avoiding the dominant animal, crouching and screaming. 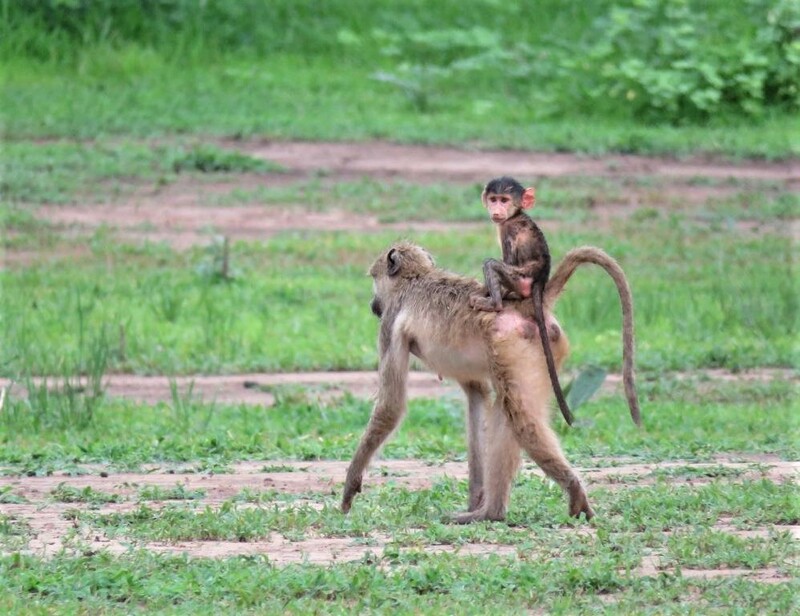 As Yellow Baboons do not exhibit birth seasonality, you will likely observe their dark colored babies throughout the entire year, riding ventrally for two to three months before they move around to ride “jockey style” on their mother’s backside. And you might be pleased to know that baboons are excellent alarms for approaching predators by giving very loud and distinct barks, which can be heard for distances over 8 kilometers. Make sure to be extra careful and alert when hearing the baboons barking. Generally, it’s a good idea to avoid the baboons and do not try to force any reaction from them (never stare at them too long), and they will usually make their way around you. Make sure to keep your distance, especially when accompanied by younger children. When food is involved, it will be a different story. 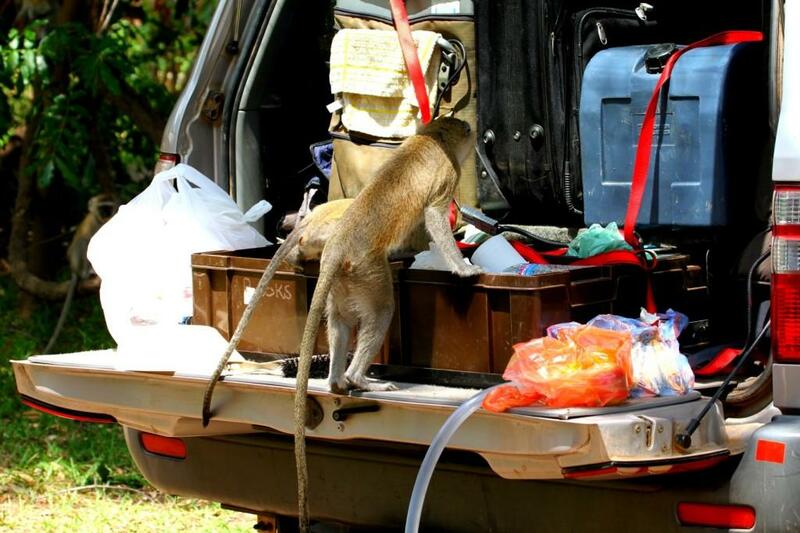 Baboons are as naughty as they are clever and strong – opening cooler boxes and car doors won’t be a problem for them. 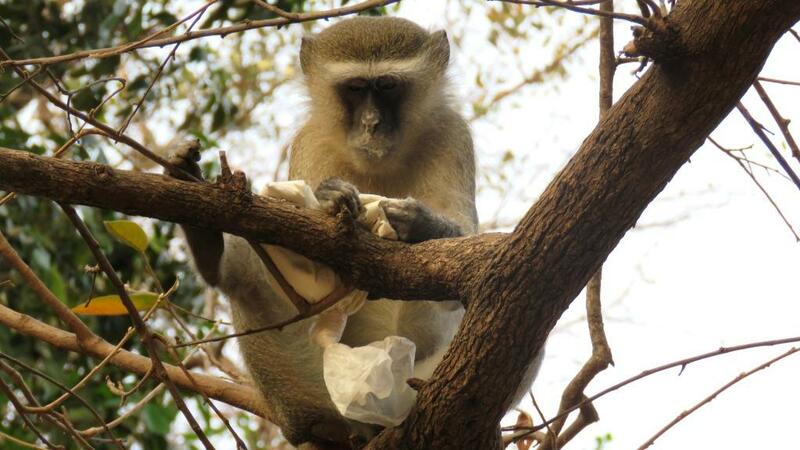 Therefore a good advice (applicable to all our wild visitors such as monkeys, baboons, elephants and hippos): Do not leave ANY food open in your rooms, tents and vehicles. Make sure to lock all food away, we are happy to assist you as we have lockers and fridges available in our self-catering kitchen and behind the Bar. Please do not feed the monkeys or baboons, as it will create a dangerous dependency on human food and will make them more agressive. 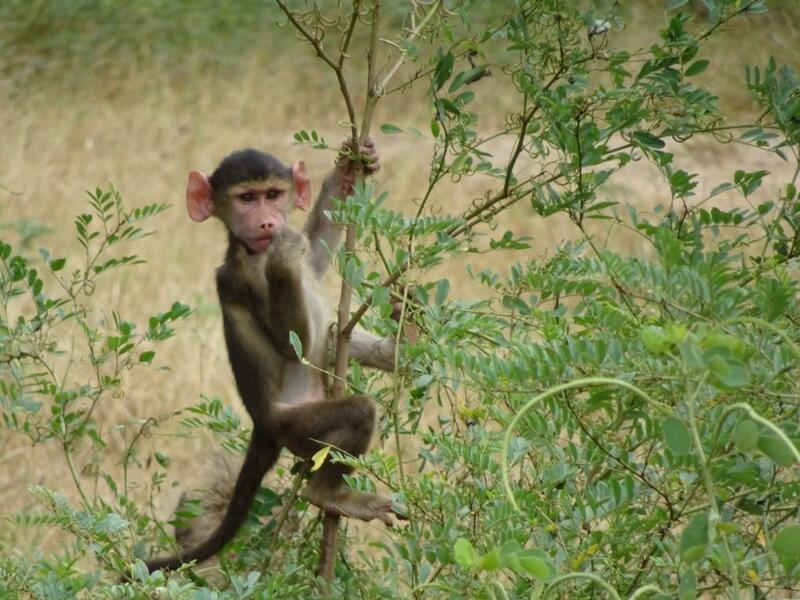 In 2012, a snow-white baby baboon (very unusual compared to the normally dark-coloured babies) was spotted in the Luangwa Valley. It exhibits a condition known as leucism, an unusual situation where the pigmentation cells fail to develop properly. 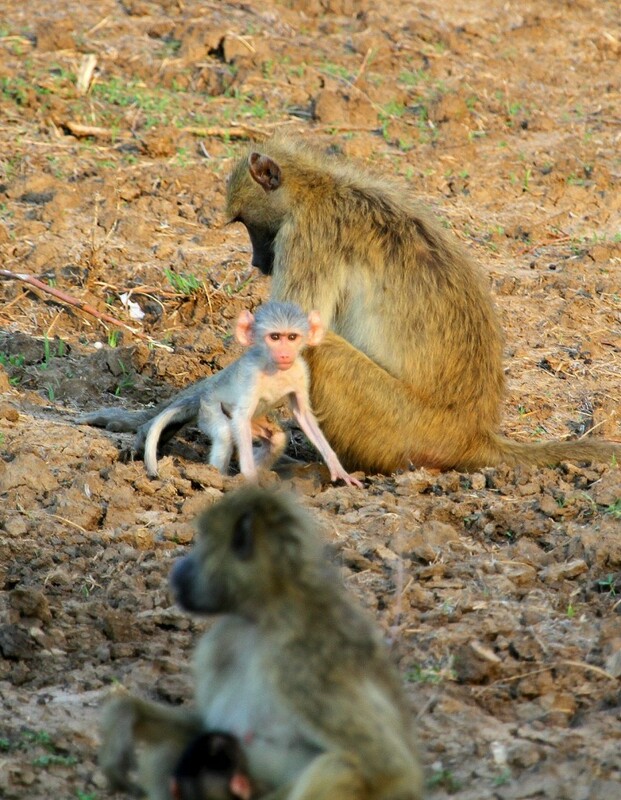 Several sightings of white baby baboons were reported after, making some people suggest that the Luangwa Valley might be a “hot spot” for leucism.